Summer is upon us, and I don’t know about you, but the warmer months seem to be the time when it’s easiest to blow my budget. Cookouts, meeting friends out on the town, outdoor events — it all adds up quickly! Even though I’ve become more and more frugal, I’ve realized you can still have just as much fun without breaking out your wallet all the time. 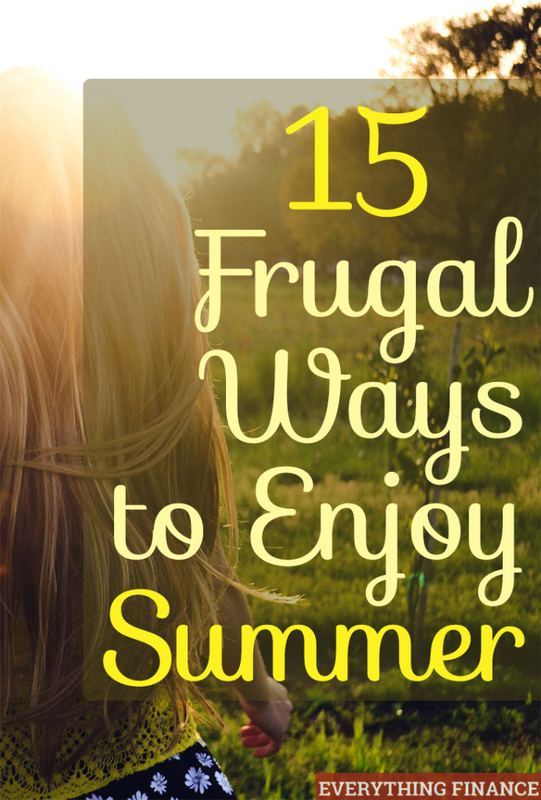 Here are my favorite frugal ways to welcome summer. The season is upon us to take everything outside, and I do mean everything. In the spring and summer, we keep the TV off and enjoy as much outdoor time as possible, even if it’s only in our backyard. You can actually take a lot of indoor activities outside. Eat lunch and dinner outside on your back porch. Read books and magazines on a blanket in your backyard. You can even hang your laundry outside to dry naturally (bonus for saving money on dryer usage!). Now that everyone is finally outside again, it’s time to meet up with your favorite friends and throw a frugal party! How do you throw a budget-friendly party? You have several options. You can either make it a potluck, so everyone brings a favorite dish (and you don’t have to splurge to feed everyone), or if you enjoy alcohol, you can provide tapas-style finger foods yourself and have everyone else BYOB. Invite only your closest friends so you can enjoy your company rather than have to run around the entire time. Yes, I know you can spend a fortune on camping gear (especially if you own an RV or a camper), but the best way to do it is to get back to nature and actually sleep outside in a tent. It’s what I would call true camping. If you have a tent and a few sleeping bags (or blankets), you don’t need much more. And did I mention how much kids love camping? It’s one of the most family friendly activities that provides fun for everyone no matter what age. Even if you don’t have the opportunity to actually go camping, you can create the same atmosphere in your backyard for a weekend. Pitch the tent and after dark, catch fireflies and roast marshmallows. The kids can sleep outside and mom and dad can always retreat indoors! Nothing says summer to me more than a picnic. Since I had my daughter, we have become avid picnickers, so much so that I keep a lot of the basic supplies packed in my car ready to go (blanket, cloth napkins, coozies, etc.). You’re going to have to eat lunch every day anyway, so why not make it better by taking it outdoors? Mid-week picnics are our favorite way to reconnect during the work week, and they give us something to look forward to. They also break up the week. Just make sure to leave the grounds better than you found them. Nothing lets you enjoy the outdoors more than connecting with nature in a park and hiking. The views, the smells, the critters, and the feeling of seclusion is an entirely wonderful and sensory experience. Big and small cities alike have numerous places to hike. If you have little ones in tow, don’t let that discourage you from hiking. Hike shorter distances so they learn to enjoy it, and when they get bigger, you’ll (hopefully) have some avid hikers to join you. It provides everyone a nice breezy way to exercise, and toddlers love it because it’s an experience they can only have with you. Just don’t forget the helmets! There’s something pleasurable about literally getting down to earth and digging with your bare hands to plant a seed that will sprout a plant or flower. Starting your own vegetable garden is a great, frugal way to reduce your grocery bill and improve your family’s health. It’s a great way to get your kids involved, too, as it helps them learn about nature and healthy living. Every town seems to have some great summer festivals, no matter how small. The town I live in only has 3,000 people, and we have a great 3 day summer festival complete with live music, parades, crafts, and good food. Scout these out in your own town, and I’m sure you’ll spot some friends out as well. What better way to enjoy summer than to enjoy it like a kid! Do all the things you liked doing as a kid, especially if you have kids to share the fun with. Catch fireflies, run through sprinklers, don your galoshes to play in the rain, play hide and go seek, enjoy the nostalgia of it all, and don’t worry what your neighbors think. It’s also a great time to take in a retro past-time and simply porch sit. Wave at your neighbors, have a cold glass of lemonade, and chat with your loved ones. Break out the ice cream maker if you have one and create a delicious treat. Don’t have one? Make your own popsicles using lemonade and yogurt or just plain fruit juice. All you need are some dixie cups and popsicle sticks to make this simple treat. I hate to say that I’ve never been big on exercise, so when I can sneak some in without realizing it, I’m happy. What never fails in our family is a pickup game of kickball (a personal favorite), croquet, or badminton. Young and old alike can enjoy these games, so let everyone join in on the fun. It’s also a great way to meet your neighbors and make new friends. Once it’s warm out, bargain hunters are looking for deals! Now is the time to get rid of all that clutter you set aside during spring cleaning. Rather than donating it all, plop it out on your lawn for one morning and try to make some money on it. You could make someone’s day by providing them a used (and cheap) item that they needed and make money in the process. Once you’ve made some dough, plan a fun summer activity for the whole family and use the earned money as your budget. Many of the activities already mentioned are kid friendly, but sometimes toddlers need their very own activities. You can use water on your driveway and big brushes to let them “paint” on the driveway or simply use sidewalk chalk. Another fun idea is to fill up a blue toddler pool and let them go to town on a hot day. This can provide hours of fun, just remember to keep it in the shade and use plenty of sunscreen. If you haven’t discovered geocaching yet, you’re in for a treat. Download a geocaching app on your phone and get to treasure hunting! The best way to do this frugally is to go to a nature park (not a national park as geocaches aren’t allowed there) so you can walk between each cache rather than drive. If you have extra trinkets around the house, you can also use this as an opportunity to leave some of them in the geocaches you find and leave your clutter for someone else to take! This season is perfect for picking your own berries. It’s a fun way to eat some healthy foods and choose the best of the crop. Many farms offer pick-your-own strawberries, blueberries, and blackberries. Just be sure to ask beforehand if the berries are organic or not. Regardless of what you decide to tackle this summer, remember to relax and try to enjoy the season. It’ll be gone before you know it! What are your plans this summer? Do you have any other wallet-friendly ideas? That’s true. It’s much better to get the kids outside!